GFA-supported workers taught reading and writing basics at a series of events held to celebrate International Literacy Day, helping improve the circumstances of low-paid families. WILLS POINT, Texas—It was a dream come true for a 50-year-old woman living in a village in northern India when she wrote her own name for the first time—a milestone made possible by GFA (Gospel for Asia) and its field partners as part of their efforts to improve the lives of some of the world’s most impoverished. The villager was taught how to pen her name through one of the many reading and writing courses run by GFA-supported workers, who recently organized a string of events to extend the program in celebration of International Literacy Day. Globally, some 750 million adults lack basic literacy skills, many of them women. Around 250 million women across Asia are unable to read and write, limiting their earning capabilities to low-paying labor and leaving them open to being taken advantage of financially. Their inabilities sometimes cause them to dismiss the importance of education for their children, perpetuating a cycle of poverty. 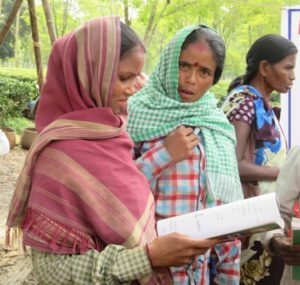 GFA-supported teams are countering this problem by running weekly classes in people’s homes, teaching reading and writing basics in English and more than a dozen other languages, including Bengali, Gujarati, Hindi and Tamil. Participants get a slate and chalk to take home and practice with, and also learn simple math. The literacy initiative—also open to men and children—is a major part of GFA’s work to help raise up members of Asia’s impoverished communities. Last year, GFA-supported workers helped around 21,000 women learn to read and write. This entry was posted in Press Releases and tagged GFA, Gospel for Asia, International Literacy Day, literacy, reading, reading and writing, women, writing. Bookmark the permalink.